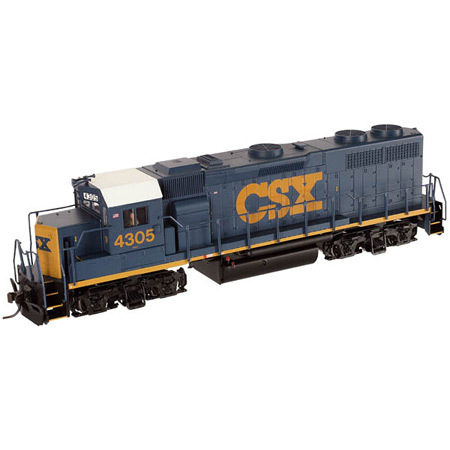 HO TrainMan GP39-2 Phase I, CSX/YN3 #4301 Features Back to Top ^ NMRA 8-pin plug for DCC Five-pole skewed armature motor with dual flywheels Separately applied hand rails and end railings Matching cabooses available separately Locating dimples for grab irons True scale dimensions with accurate details Realistic die-cast underframes Equipped with AccuMate? Couplers Overview Back to Top ^ The GP39-2 was offered by EMD as a fuel- efficient alternative to their very popular GP38-2 model. This efficiency resulted from the use of a turbocharged 12-cylinder 645E3 diesel engine, as opposed to the non-turbocharged 16-cylinder prime mover in the GP38-2. The use of a turbocharger increased the horsepower output from 2,000 to 2,300hp with four fewer cylinders. One other benefit of the turbocharger is improved operation at higher altitudes where thin air causes normally- aspirated diesels to lose power and produce excess smoke. The largest original fleet of GP39-2s was assembled by the Santa Fe who, over the course of seven years, acquired a total of 106 units. Our model represents a “phase 1” GP39-2 locomotive which was produced between 1974 and late 1976. The overall appearance of a phase 1 model is similar to that of a GP38-2 except for the presence of a single turbocharged exhaust stack. There were only four original owners of the phase 1 GP39-2 including Santa Fe, Reading, Delaware & Hudson and a single-unit order for Kennecott Copper. Many of these units had interesting careers and nearly all are still in service today operating for BNSF, Union Pacific, CSX, and Pacific Northwest shortline Portland & Western.